Join Century Cycles and Bike Cleveland for our biggest and most popular ride of the season! Our regularly-scheduled Night Ride on the Towpath Trail is transformed into a rolling pajama party! The ride is FREE and no pre-registration is required! 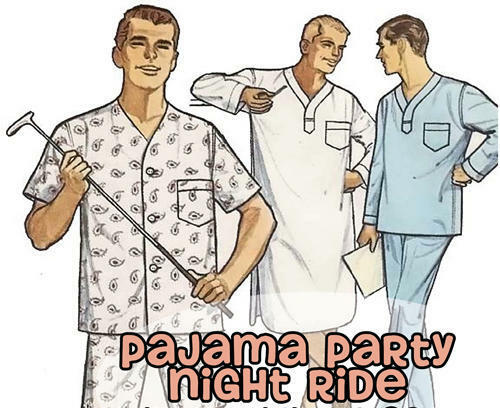 The fun starts at 7:00pm in the parking lot of our Peninsula store, where you'll sign in, enjoy make-your-own smoothies on our bike blender, and admire your fellow riders' choice of sleepwear! Our friends from Bike Cleveland will be there to talk about all of the great work they do to make bicycling more fun and more safe for everyone in Northeast Ohio. If you make a donation to Bike Cleveland, or join or renew your membership at the event, you'll be entered into our prize raffle! The raffle drawings will take place beginning at 7:45pm. At 8:00pm sharp, we'll begin our bike ride on the car-free Ohio & Erie Canal Towpath Trail in the Cuyahoga Valley National Park. 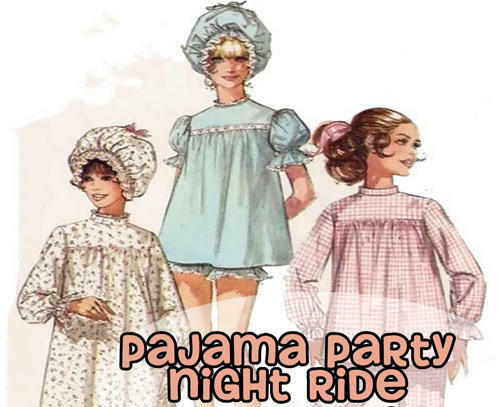 We'll ride NORTH about 7 miles to the Brecksville Station Road Bridge, take a break for FREE pajama party-themed snacks, then turn around and ride back to Peninsula. Many people enjoy post-ride food and beverages at The Winking Lizard Tavern next door. You can ride at your own pace, and all ages and skill levels are welcome! Children under 16 must be accompanied by a parent or guardian. You must have your own bicycle, helmet, and headlight. Check your bike over ahead of time to make sure it's ready to ride. Make sure your pajamas do not interfere with your pedals, chain, or wheels. Arrive early to have plenty of time to find parking (use the Lock 29 Trailhead or overflow lot on Mill Street), get yourself and your bike ready, and sign in. Hard rain and/or thunderstorms will cancel the ride. Call the store at 330-657-2209 or join the event on Facebook for any last-minute updates.